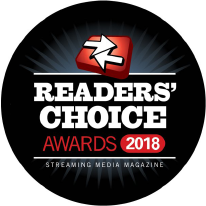 Voting in this year’s Streaming Media Readers’ Choice Awards 2018 has now opened, and we are pleased to announce that castLabs has been nominated in three categories! Voting closes September 21, so vote now! This is an annual industry award hosted by Streaming Media Magazine which lets readers choose their favorite streaming technology. Winners will be announced on November 14 at Streaming Media West later this year.